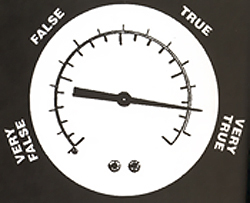 With the use of certain operators, true is treated like 1 and false like 0. In your Firebug console, you can verify this. console.log(true === 1); // outputs false. true is not the number 1.
console.log(false === 0); // outputs false. false is not the number 0. Hence, (false == 0) is true, but (false === 0) is false. Truthy and falsy are what we use to determine the result of a conditional expression. They are what we use to determine its result, they are not the result. Everything else is truthy, and that includes Infinity (which is another special number, like NaN), and all Object objects and Array objects, empty or not. In a conditional statement, conditions are evaluated from left to right. In the case where we have if(condition1 && condition2 && condition3...), if the first condition is falsy, the second condition is not evaluated. For this reason, it is wise to order the conditions so that the condition most likely falsy, or strict, is put first, and the most processing-intensive condition is put last. In a conditional statement of the form condition1 || condition2 || condition3... , if the first condition is truthy, then the second condition is not evaluated. * : Last means 'the expression that stops the evaluation'. If car is defined, and not an empty string, nor the number 0, it is truthy, hence it stops the evaluation, and its value is assigned to myCar. If car was falsy, then myCar would be initialized to an empty object. The number 5 is truthy, so the code between the curly braces is executed. What happens now when we assign something like this to newName...? The result is an empty string. Why is this so, you think? Hint: Nothing mysterious going on here. The explanation is in the article. Explicitly so. newValue will be equal to what, and why? This tutorial was helpful to you? Post a comment and/or donate. Thank you.